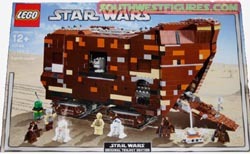 Legos are a popular way to collect Star Wars memorabilia Legos are generally manufactured for short periods of time, usually under 1 year. Over the last few years, Lego's have gone hi-tech using more unique shapes to make more realistic looking building sets. Comes with a crane to load the droids inside the vehicle; a cockpit for a Jawa or some crazy droid driver with steering mechanism! There are plenty of figures to keep you busy: Includes: 11 mini-Lego figures including 3x Jawas, 1x Uncle Owen, 1x R2-D2, 1x C-3PO, 1x R1-G4, 1x ASP Droid, 1x R5-D4, 1x Gonk Droid and 1x Treadwell Droid. Measures 15" long x 7 1/2" wide x 9" high (assembled). 1,669 pcs. The fastest ship in the galaxy! - The Millennium Falcon. 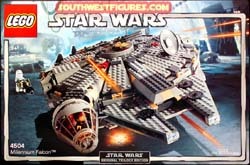 One of the most popular Star Wars lego sets. Includes: 5 mini-Lego figures including 1x Han Solo, 1x Chewbacca, 1x C3PO, 1x Snowtrooper, 1x Princess Leia. Measures 3.8" high x 15.1" wide x 22.6" long (assembled). 985 pcs. Product weight ~5 lbs. Ship weight ~10.4 lbs. Product does not actually fly. Product images shown in fantasy situation. Black and Silver Original Trilogy Collection (OTC) Style Packaging.